I had been writing this book in my mind since the day my son Fionn was born…if not, even earlier. It was, as the cliché goes, a labour of love. I took stories I had written—some published, some not; I wrote new stories, and I wove them together into an anthology of love. Pieces of me, his father and the rest of his family, Fionn would have forever. A way for me to be with him when I’m gone from this earth. Something that might ease any pain or loneliness he may, God forbid, encounter. The word anthology, of Greek origin, means a gathering of flowers. And so for Christmas 2015, I gave him this bouquet. Part love letter to her son, part personal history, I Need You To Know is a testament to family. Erin’s love – for her husband, her parents, her in-laws and above all her son – exudes from every page. Happy families do exist. And while each one is unique, this book will resonate with anyone who has one, or wants one. The essays, poems and letters are well-written, touching, thoughtful and at times very funny. It’s a pleasure to read. Few things are as powerful as a mother’s love. In her beautiful book dedicated to her son, Fionn, Ottawa writer Erin Scullion expresses the depth and breadth of that bond with words, images, letters, stories, and poems. Reading her work will make you cry, laugh, and cry again, and then inspire you to write down your own story for your own children. Thank you Erin for telling the story of creative and modern Mom … the decisions, the ups and downs, and so eloquently. Thank you also for sharing the inside of your soul. P.S. Fionn, you are lucky boy! Enjoy! When it comes to cutting through emotional red tape, Erin Scullion has the sharpest scalpel in the tool kit. She lives a wholly authentic life and – with quiet determination – requests the same of those she keeps in her heart. Her keen wit, (often self-deprecating), quick brain and original turn of phrase make I Need You to Know an evocative love letter that her son will cherish. So will others who benefit from its wisdom. It is a total joy to read. Totally charming. I loved it! It made me laugh out loud many times, as well as teary. Thank you for the insights, and for sharing so much of yourself, your family and your stories. It was heartwarming. I hope Fionn likes it – if he doesn’t now, he will appreciate it in the future! 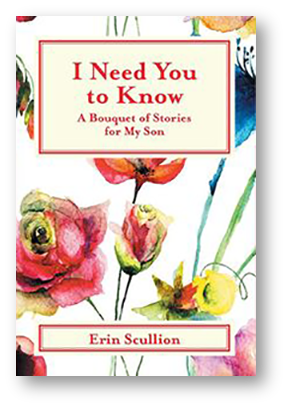 Erin Scullion is a wonderful storyteller whose loving bouquet to her son is a gift to us all. Brimming over with affection, generosity, and understanding, there is something in I Need You to Know for everyone who has cared deeply about what it means to live in our increasingly baffling world. More than anything else, it is a model for how parents can and should talk to their children.